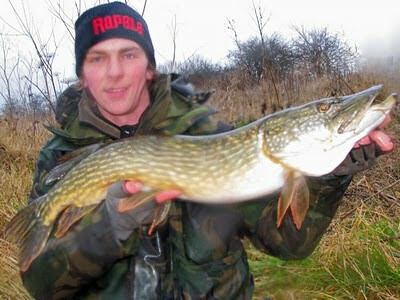 Andrew Kennedy's Angling Blog at Just-Fish.co.uk - Fishing Blog Coarse Fly Lure Pike Perch: Happy New Year! Happy 2010 everyone. Let's hope that this year's a productive one, whatever we're fishing for. As I write, the snow is falling and we already have at least 4 inches piled up outside that has fallen today on the Nottinghamshire/Derbyshire border. 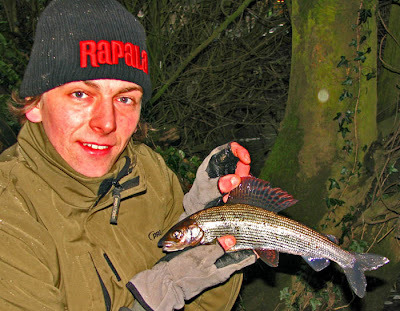 This really has been an exceptional cold snap and while short cold spells can mean good fishing for some species, prolonged cold weather such as this tends to slow down pretty much everything that swims. With all of the snow falling into our rivers and lakes and the continued cold temperatures (with many parts of the UK struggling to break above 0 C, even in daytime!) the water temperature will be extremely low and lower than most species require to enable them to feed and digest what they eat. When we eventually do get a thaw, be prepared to head out and fish as you could be in for a red letter day. There will be some very hungry pike, chub, roach, grayling and perch out there just waiting for a warm spell to trigger a feeding frenzy. Location will be paramount to a good day's sport, but get this right and these species will be crawling up your line to get to your bait box! I ventured out into the cold for a couple of slow sessions just before new year. First I fished for grayling; I started out trotting but bites were not forthcoming. A switch to a crumb feeder did eventually bring me 5 or 6 bites, which resulted in two grayling landed - both around the pound mark - and a couple of fish lost on the way to the net. Matt who I was fishing with also managed a good grayling and a couple of trout, but got smashed by something very powerful - possibly a barbel or a huge trout - on a big lump of bread flake. The following day I fished the Trent for pike, and with the snow melt going in the river was very coloured and rose by almost a foot while I was there! These were some of the worst conditions for river pike fishing, but I did manage one fish and had a few dropped runs which I'm pretty sure were chub, as I didn't connect with them and my deadbaits came back in sucked rather than chewed! This low double was my only reward on a tough day. As you can see by the water on the lense, it was a damp old day! I also found the complete skeleton and remnants of fur of a large, canine-toothed mammal. I've brought the skull back to clean and identify but I'm 99% sure it's either an otter or a mink. I've seen mink on the Trent before and whilst they're tremendous creatures to watch, I'm uneasy about this alien (very agile, adept, versatile & efficient - both in the water and on land) predator rampaging in the wild in this country, so I'm hoping it's not one. If it's an otter on the other hand, I'll be quite impressed; I've never seen a wild one in the UK and whilst I know they're hardly an angler's best friend, I for one am in favour of their re-introduction and I'd love to see one up close. They're one of our natural freshwater predators and whilst we may not like them eating "our" fish, they belong in our waterways just as much as kingfishers, pike and perch do. If it wasn't for human persecution, protecting trout and salmon stocks, they'd still be abundant in the wild anyway. I think the fact that they've been virtually extinct for a few generations, means that it's now quite a shock when we witness a large dead fish killed by an otter because it's not something we're used to. I think this has caused a bit of a panic amongst some anglers and fishery owners but I seriously do not think that a rise in otter numbers will lead to any drastic decline in average or largest fish sizes nationwide. Izaac Walton didn't seem to struggle and back then otters would have been a common sight in most of the country's waterways! Being mainly a predator angler myself, I have explained on multiple occasions to other anglers the importance of the natural predator vs. prey balance, especially when condemning the short-sighted "anglers" who feel the need to kill/cull pike. Well, suprise surprise, although they're furry rather than scaly, otters are also part of Britain's natural predator/prey balance! I can think of one well known angler who has previously stressed the importance of predators, yet has also condemned the re-introduction of otters! Cormorants (another can o' worms completely!) are a slightly different story because they now feed and breed much further inland than they naturally should, BUT it's still our fault as humans, for we have removed all their food from the seas surrounding us, so they have a simple choice: Die on the British coast or adapt and find food elsewhere. It's a natural survival instinct and much as I dislike the things (I've personally had cormorants completely wipe-out a lake more than once and have had to take extraordinary measures to prevent future gluttonous attacks), I can't knock 'em for their ability to thrive in adversity! I did brave the cold waters of the river Derwent on Boxing Day to enter the annual raft race, which was even more of a laugh than last year although I'm glad we only found out about the dead body after we'd finished! 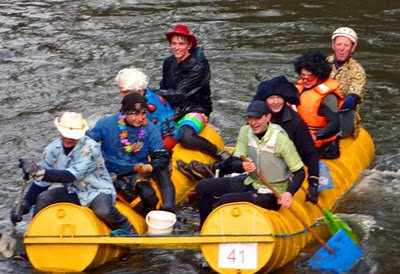 Here's our monstrosity of a raft in action, I'm in the fetching red cowboy hat! Hi Andrew, I agree with your comments about otters being reintroduced to our rivers and I think the angling press have been causing a lot of unnecessary concern. Although I have seen a fair number of mink whilst on the bank and they can have a big in pack on most wildlife and not just fish. I hope to get a day or two's pike fishing in this week so I'll keep my eyes peeled.